The WGG green wristband “Girls Rights are Human Rights” makes it way to Rome! Christina is a 17-year-old girl living in New York City who is about to graduate from high school. 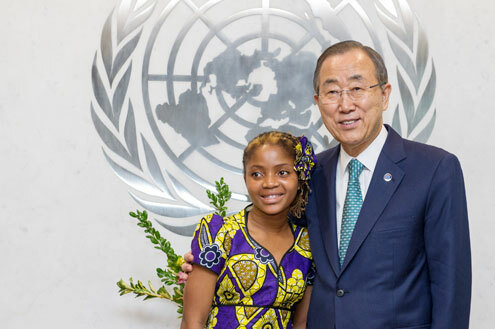 She has been a Girl Advocate for The Working Group on Girls NGO for the past three years and works on the Girls Participation Task Force and Steering Committee. Christina is featured on the webpage. Did you take the quiz yet? I got 100% What did you get? 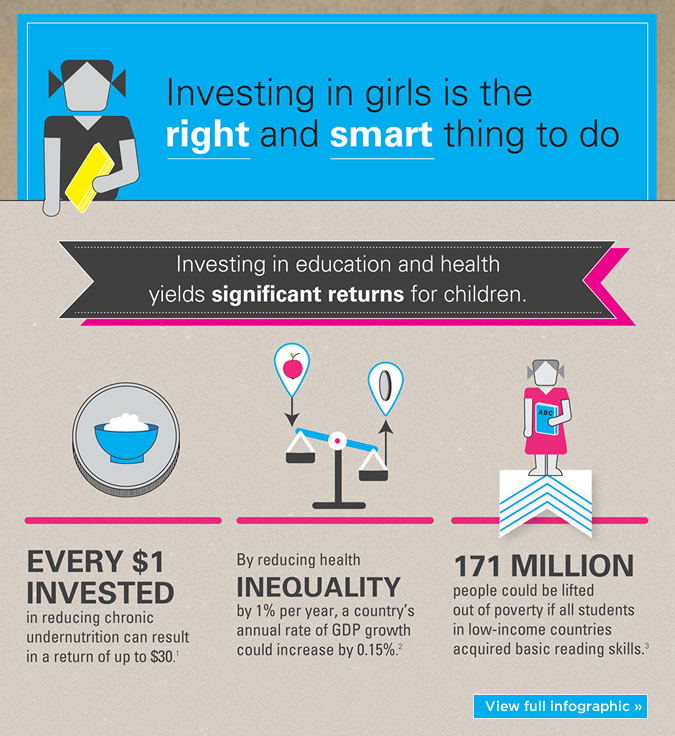 Check it out – there is a lot of good information which could be used to lead discussion on girls and girls rights. 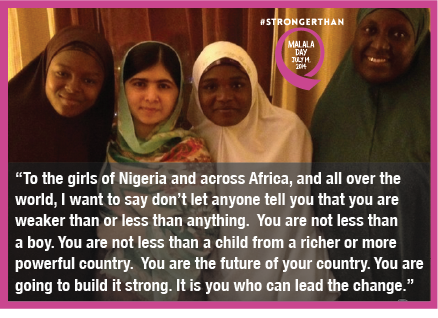 Nnenna Agba speaks for Nigerian girls. Education is the key that opens doors to progress. As I post this photograph telling us of Nigerian girls desire for education I am immediately thinking of the girls who have been kidnapped. 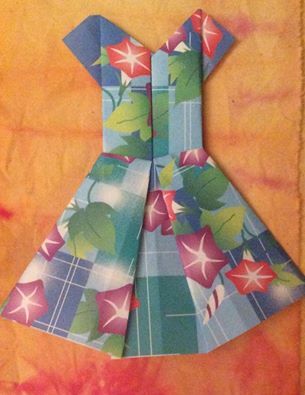 It is day 110 and on Facebook we are united with Rifkatu and this is her dress – Follow on Facebook Each day a dress is made for a specific girl so as not to forget and to be in solidarity with all 273 girls. Nnenna is the lucky one. See her story on the website. Strategic objective L.4. 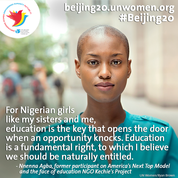 Eliminate discrimination against girls in education, skills development and training. Millennium Development Goal 2 – Achieve Primary Education Proposed Sustainable Development Goal 4 – Ensure inclusive and equitable quality education and promote life-long learning opportunities for all. When will rhetoric end and real political will for change begin? What is the systemic cause for this continued violence against girls? Share your thoughts in the comment section. Click here to read the red flag document of the women’s major. These flags highlight critical areas needing attention in the Outcome Document – Open Working Group on Sustainable Development Goals. If you have been following this blog you will know that there are 17 sustainable development goals outlined. There is an introductory section having 18 paragraph leading into the Goals. ” We welcome: The standalone goal 5: “Achieve gender equality and the empowerment of women and girls” with its targets to end all forms of violence, discrimination, early and forced marriage and harmful practices against women and girls, universal access to sexual and reproductive health and reproductive rights, to ensure women’s full participation in decision making, and equal rights to land and economic resources. We also welcome the fact that gender equality and women’s rights are addressed in different goal areas including equal rights to education and life-long learning, to decent work and equal pay for work of equal value; the stand alone goal on inequalities within and between countries, as this is imperative to addressing the root causes of poverty; and the targets to reverse the trend towards ever growing income inequalities by reforming global financial systems and fiscal measures; the goal on peaceful inclusive societies and its targets on participatory decision making, access to justice and reducing arms flow; the goal on Means of Implementation (MOI) and that in addition each goal area has its own set of implementation targets – although many of these MOI targets lack ambition, we welcome the fact that, unlike the MDGs, the agenda has standalone goals on ecosystems, ocean, sustainable consumption and production and a standalone goal on climate change which recognizes women’s role ; and that, the agenda comprehensively aims to end poverty and hunger, ensure healthy lives, universal access to water and sanitation for all. However, the Women’s Major Group has continuously called for stronger rights-based targets and a deeper transformation of our economic and financial systems, which we regret are not reflected in the outcome document: the proposed SDGs are still not sufficiently ambitious, transformative or rights-based, and we present our “red flags”. Red Flag 1) Absence of Human Rights. Red Flag 2) Sexual and reproductive health targets do not go far enough. Red Flag 3) Concentration of power and wealth imbalances that deepen poverty and inequalities within and between countries are not sufficiently addressed, and the agenda lacks targets to reverse this trend. Red Flag 4) The burden of unpaid domestic and care work still rely on women. Red Flag 5) Lack of recognition of women as farmers, fishers, indigenous peoples and key for sustainable natural resource management. Red Flag 6) Insufficient attention to women’s role in peace and justice. Red Flag 7) Concern around “partnership(s)” Red Flag 8) Technology focus remains on trade and private access. Which of the goals and which of the red flag issues would directly advance your project?